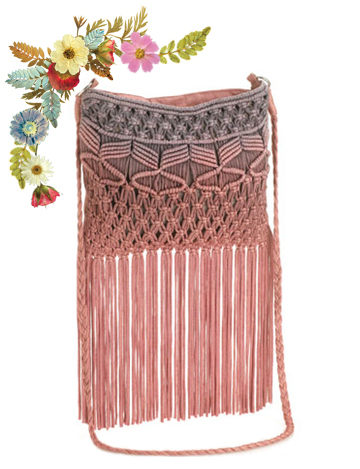 Just fooling around with the tiniest of macrame purses. My littlest granddaughter Tallulah loves her Barbie dolls. It’s amusing to watch her dress and undress them, or spend time folding some small cloth into a useful accessory. I sense she has a soft hand. Naturally I’m hoping she develops a heart for fabric and thread. Barbie’s macrame purse is very simply knotted in one long rectangle then folded in thirds and sewn up the sides. I used Beadsmith cord size FFF along with matte gray triangle beads. The fringe ends were wrapped with sewing thread, then trimmed and Fray Checked. There is a silk lining that is not at all noticeable, and a sweet little brass chain that makes for a snazzy strap. All in all it’s pretty sturdy, so I think it will hold up well over time. Or in the blink of an eye when she becomes too old for Barbie, whichever comes first. 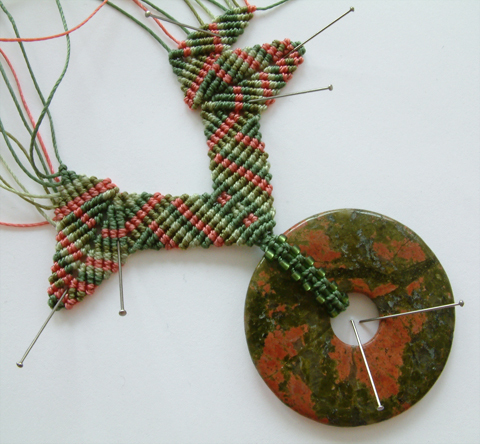 Macrame as art? Check out these really cool silkscreen prints available from Rachel Domm. Supersized at 16″ x 20″, they come in two yummy flavors, red or blue. Since I absolutely love anything (really anything) if it comes in red, I ordered mine today. I love the fact that it’s printed on newsprint because of course it will yellow with time. I’m looking forward to that. I have always loved the notion that handcrafted functional pieces, while worth all the time and effort put into making them, are nevertheless temporary objects to be used or cherished within their relative lifespan. 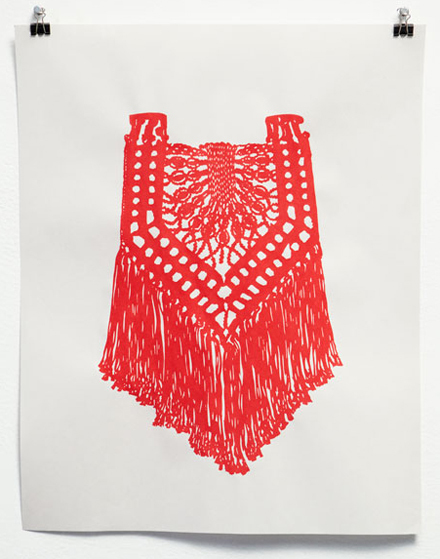 Also if you have a bit of time check out her perfectly lovely Macrame cut paper work by selecting Cut It Out – I & II here. I have my heart set upon these beautiful art dolls by Christine Alvarado of Du Buh Du Designs. I’m especially taken with “Marjolaine’s” vintage linen dress. I’ve been much too absent of late. I’ll spare you the lame excuses but one of them involved an accidental electrical incident that put my pc in a tizzy. Anyway, I hope to make it up with this really special piece from Isha Elafi. Harkening back to a Tuscon gem show I attended some years ago, I happened upon a booth that blew my macrame mind to pieces. One of two necklaces I bought that day, this one is my favorite. I love the combination of peridot green and purple and turquoise. It seems the colors of an early Spring garden. I must confess I’m in the middle of a sewing binge right now. I’m currently consuming twice the recommended amount of fabric and defiantly defensive about changing my behavior or my perceived need to increase my wardrobe. 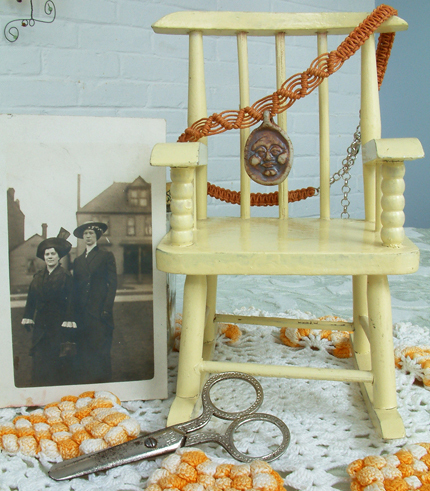 Until I get back to knotting here’s a peek at what my scavenging netted me from Town & Country Antiques in Livonia: another piece of furniture for the dollhouse I don’t own yet – a wee bit crooked yellow rocking chair, a rather elaborate pair of safety scissors, and a photo that reminds me of my sister and I (because we don’t look very much alike either). Draped on the chair is a macrame choker worked in Irish waxed linen that I once used as a class sample. I hope you noticed the textured doily. My dear grandmother must have spent weeks crocheting all those yellow popcorns. The sturdiest of women, I will always be in awe of her innate talent. I’ve been lovely busy lately, but I carved out some quiet time on Friday to try a couple of macrame techniques that are new for me: 3 microdots of Cavandoli above the beaded loop, and the leaf shapes. Just goofing around and making design changes as I go. There has even been some unknotting. Thank goodness the cord has been more or less forgiving. At the start of this piece I wanted to convey a sense of denseness. My intention is to follow this with a lighter lacier section. I’m intrigued with the idea of a one contrasting texture growing out from another. Ohh! Ahh! 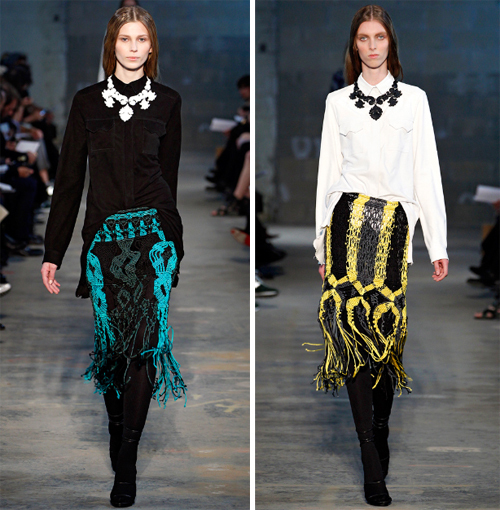 Love the swingy macrame skirts by designers Jack McCollough and Lazaro Hernandez of Proenza Schouler. Normally I wouldn’t think this is something you could wear just anywhere, but paired with a beautifully tailored slouchy shirt they become casual elegance. Sometimes I leave the antique store empty-handed, sometimes I score big time. Or in this case, tiny time. 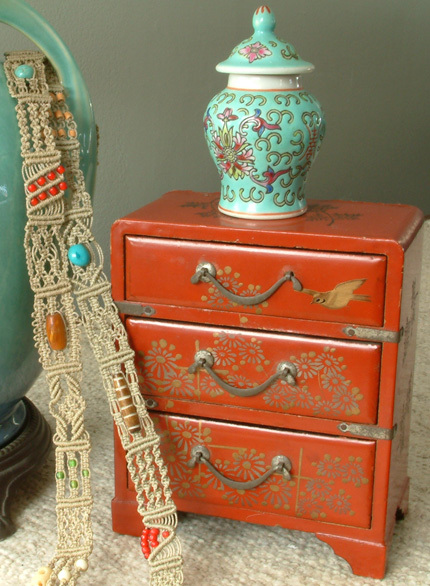 Because I just can’t get enough of all things miniature, I scooped up this 5″ Oriental chest of drawers. The little vase atop was purchased at a garage sale last summer for 25 cents. Some day I would like to house all my little things in something that is not really a dollhouse but would function as one. I’m still looking for that special cabinet or cupboard. 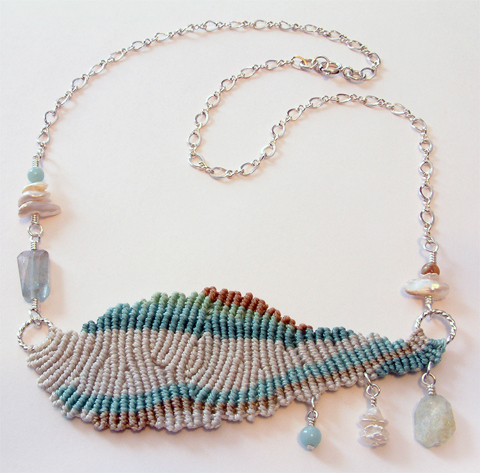 The macrame necklace (not fully shown) is one of my first attempts at micro-macrame knotting. It’s a sampler of knotting designs that I borrowed from one of my very first beading books, Exotic Beads by Sara Withers. or have I read too much fiction? …a vague segue to one of two podlike shapes I created last year. They have become my favorite micro-macrame pieces of late. Even in their unfinished state I have enjoyed staring at them. Over time I have introduced them to various elements, and now I’m finally happy with all my arrangements. I wish I could tell you what the iridescent stones are, but I plum forgot to ask when I bought them. Hanging and dangling are tiny pearl nuggets and Amazonite. 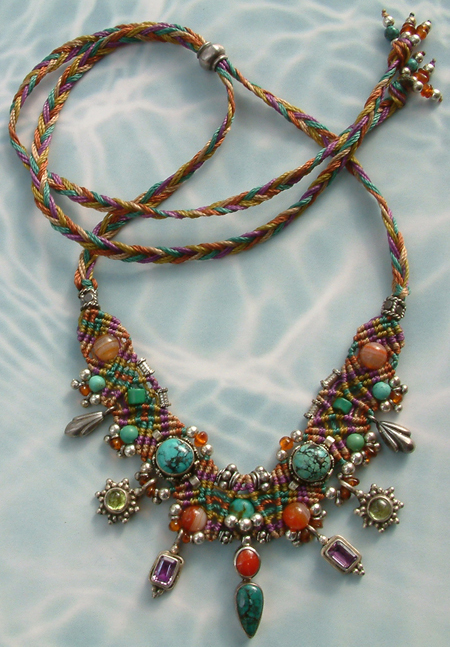 The macrame was worked in Conso and C-Lon cord. The sterling silver chain and twist wire jump rings have long been in my stash.